Scripts, Scrolls and Letters - A picture may speak a thousand words but there are times in life when a few well-chosen words can say volumes and move mountains. Who amongst us has ever forgotten the exact time and place we were when that special someone, the who caused our heart to grow faint at the sight of them, looked deep in our eyes and proclaimed for the first time, "I love you". You swooned. We all did, and still do. It is an integral and beautiful part of the human condition. Sometimes, a few words can say it all. A heart tattoo is one thing, a heart tattoo that says "Mom or Dad" in a ribbon or scroll across the heart takes it to a whole new level. Getting a tattoo with the name or the initials of the one you love can be a greater commitment than getting married. You may part ways with the one you once loved, but the tattoo will still be there. There is an old expression among tattoo artists, "Love last six months, but a tattoo lasts forever!" Tattooing has long been enamored with words. Sailors tattooed HOLD on the fingers of one hand, and FAST on the fingers of the other, as protective amulets so that they would never lose their grip on the riggings and lines high above deck and plunge to their death. LOVE and HATE, LOVE and PAIN, LIVE and FAST are all tattoos that have been popular on fingers over the years. Political prisoners often tattooed slogans on their bodies as their only form of protest. Prisoners and gang members still tattoo powerful words on themselves as form of identification and affiliation. Biblical passages, proverbs and hymns have often been very popular tattoos. Likewise, Buddhist texts are reminders of spiritual truths and also act as protection against evil. Even more magical are the tattoos inked by priests in Thailand. Devotees pray in preparation for the tattooing ritual of the sacred text, and may enter a state of ecstasy afterwards. These texts, beautiful in form and meaning, originate from enlightened minds, so placement on the body should be considered with care. Angelina Jolie, Brandon Boyd, and David Beckham carry sacred texts around with them, including the well-known 'Om mane padme om', which denotes loving kindness, purification and protection. Mantras like these are powerful, so should be correctly drawn and appropriately located, always high on the body. Proportion and construction of the characters might also be important, since the text sometimes gains power from its form, not just from its intellectual meaning. In India, some sects have sacred Hindu texts inscribed on every part of their bodies to protect them from harm - even inside the mouth! There's no squelching the devotions of the devout. And in Japan there's the famous ghost movie where the young monk is covered with sacred Buddhist text -- except for one ear. And that's where the nasty spirit got to him, through his ear! It's also a good idea to check out the implications of the sacred text you're considering. It's not cool, for instance, to take Koranic scriptures into the bathroom, or any place containing impurities. Islam also prohibits certain illustrations of living beings, but tattoo lovers have skirted the law by shaping text into animal forms -- elephants, fish, birds -- a practice called zoomorphic calligraphy. A number of well-known celebrities have tattooed "Know your rights", "breathe", and "Quod me nutrit me destruit" - Latin for "What nourishes me also destroys me". 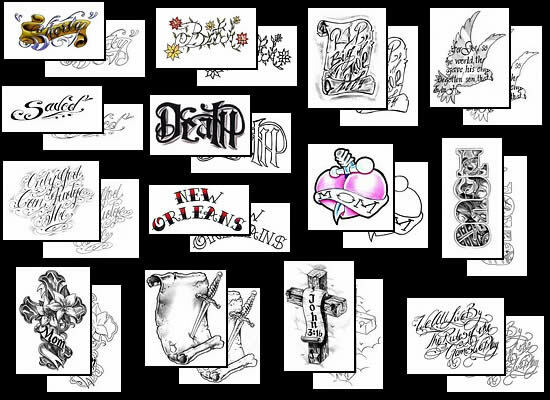 Other popular words for tattoos are song passages. Robbie Williams has a line the Beatles song, "All you need is love..." tattooed on his body. Foreign languages are popular, with Japanese kanji and Chinese characters being the best known, but many people choose passages important to them in Spanish, Latin, French, Sanskrit, Farsi and many other languages. Often times the words are inscribed within a ribbon or scroll to stand out or to be worked into a larger tattoo. This is particularly true in Memorial tattoos, which may also have names of individuals and times and dates. Another way to make a passage or saying unique is in the creative and imaginative use of fonts. Fonts are the styles of type used in print-setting. Some people may choose to have their family name tattooed in Olde English or a Gothic script , well other may choose a more modern font that best suits their phrase. The names of loved ones have long been tattooed as if they were hand-written in a delicate script. Sometimes you can tattoo it and other times you just have to say it! For more about text based tattoos see: "BODY TYPE: Intimate Messages Etched in Flesh" the first book devoted entirely to typographic tattoos.